Due to the generosity of Mrs. Albert Gehner, Mr. Theodore Friedhof, and many other benefactors, this site has become a focal point of agricultural activity in Platte County. The donation of this land, formerly known as the Browner Farm, and a large sum of money enabled the dreams of several area residents to become reality on June 3, 1941. On that date, a non-profit organization was formed for the purpose of "encouraging improvement in all things pertaining to agriculture, industry, merchandising, domestic science and good citizenship in Platte County." Since that date, county fairs have been held annually under the supervision of a 15-member board of directors, elected from throughout the county. Numerous activities promoting livestock breeding and the work of 4-H and F.F.A. clubs are also held frequently. Thoroughbred horse racing meets are held each summer. Hundreds of college scholarships have been awarded to deserving students of the county since the inception of this society, and many donations have been made to worth-while civic projects. 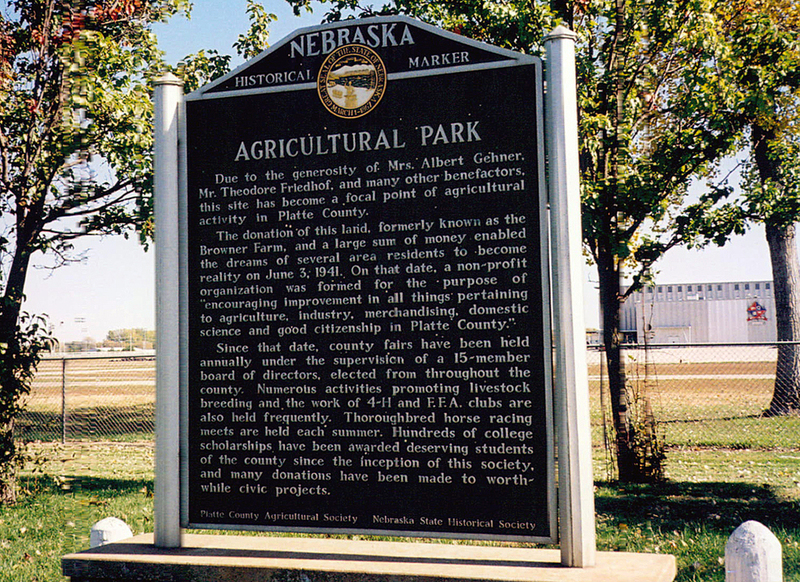 “Agricultural Park,” Explore Nebraska History, accessed April 18, 2019, https://mynehistory.com/items/show/411.